The preeminence of ethnic diversity in scientific collaboration. Do diverse teams perform better? Yes! Studying the publication patterns of 6 million scientists AlShebli et al. find that papers with ethnically diverse teams have a 10% gain in impact . This is of course correlation, not causation, but it highlights the important fact that diversity is a valuable asset. I would say this is not only case in scientific publishing but for every occupation - especially government . The strength of long-range ties in population-scale social networks. A pretty recent (published on December 21st), but nonetheless stunning piece of work. It’s probably my favorite network science publication of the year. It deals with the strength of social ties and how they decay over network distance (bear in mind this can be different from geographical distance). We generally imagine that our closest and strongest ties are with people in our immediate social circles and the further away we move they become weaker. Actually Park et al. shows us that this is not true. Your ties do become weaker as network distance increases but there is a tipping point at which your ties stop decaying and in some cases become stronger. Park and co-authors even discover something they call wormholes (see figure borrowed from their paper below), which are extremely strong ties that span large network distances. And they find these wormholes in 11 culturally diverse population-scale networks, from twitter to phone networks. Macroeconomic evidence suggests that asylum seekers are not a “burden” for Western European countries. A pretty thought provoking piece of work, especially seen in light of current anti-immigration populist agendas in Europe. Applying methodologies traditionally used to estimate the macroeconomic effects of shocks, d’Albis et al. show that inflows of asylum seekers do not deteriorate host countries’ economic performance. Instead, they find that the increase in public spending induced by asylum seekers is more than compensated for by an increase in tax revenues. Further, as asylum seekers become permanent residents, their economic impacts become even more positive. Unfortunately, this paper has not gotten the publicity it most definitely deserves. All-optical machine learning using diffractive deep neural networks. This is an interesting proof of concept. Basically Lin et al. show that it’s possible to 3D print a deep learning architecture (see image below) which using diffraction from multiple physical layers can classify handwritten digits with 90% accuracy. How cool is that!? However, I have tons of questions for this paper (while my knowledge of optics is a bit rusty) I remember that wavefronts are superimposable (meaning they are additive), so how this can be used as a non-linear classifier is unclear to me. Inferring Mechanisms for Global Constitutional Progress. A phenomenal publication by Rutherford et al. analyzing all the worlds constitutions and identifying similarities. Looking at temporal patterns they find an adoption hierarchy, which is a general pattern of how constitutions develop over time. Fundamental provisions about how to run a country are encoded first, then general rights are added and only then are rights for minority groups such as children added. For non-governmental and international organizations, such as UNICEF, which spend great resources on advocacy this knowledge is vital because it tells you that if you want to advocate for the rights of the most vulnerable you might need to package it with advocacy efforts for general rights. As an example, if you are trying to push for children’s rights, data shows that they never come before the right to unionize, you will achieve better results by bundling them together. You should also check out their interactive page that lets you explore the data further. Analyzing gender inequality through large-scale Facebook advertising data. Identifying inequalities, especially with respect to gender, is an important first step in achieving the sustainable development goals (particularity goal 5) and in building a more equitable society. However, gathering such data can be difficult. In this paper Garcia et al. demonstrate how the ad API of the 3rd most evil company in the world, Facebook (my personal top three: Palantir is first, second is McKinsey), can be used to proxy real inequalities with respect to education, health, and economic opportunity. They show that gender divides on Facebook explain various aspects of worldwide gender inequalities. This paper is an excellent example of how ingenious use of “small-data” can give us new astonishing insights. Upper‐Body Strength and Political Egalitarianism: Twelve Conceptual Replications. How do you form your political views? By logic and reason alone, or does something else influence you? The research is founded on well-studied conflict behaviour in animals where physical strength shapes behavior. E.g. if an animal is stronger than their rivals they are prone to asserting themselves in the struggle for status and resources, while if they are weaker, they prefer to withdraw from conflict. Petersen and Laustsen show that modern men (not women) apply the same logic. They find that upper-body strength correlates positively with support for inequality . This is the first time I have read a political psychology paper, but it will most certainly not be the last. A large impact crater beneath Hiawatha Glacier in northwest Greenland. 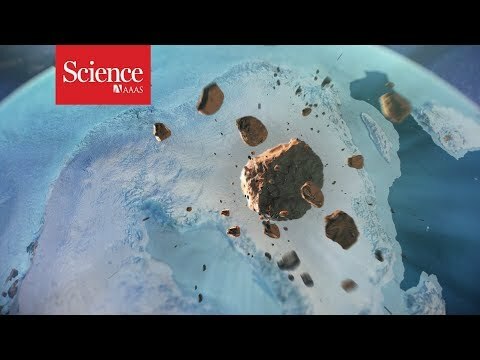 Imagine discovering a hidden 31-kilometer wide meteor crater beneath a 2 kilometers thick ice sheet from an impact that might have occurred as little as 13.000 years ago. While I have to admit the actual paper was too technical for me to fully understand this nice write-up in Science explains it well. It basically reads like an Indiana Jones on ice adventure. This meteor impact is a possible explanation for the Younger Dryas period, a sudden approx. 1000 year long cold dry period right after the last ice age, an event that has been speculated to have forced humans to start cultivating grasses and grains as other foods sources were dwindling. Also check out the below 3 min YouTube video about the paper. Word embeddings quantify 100 years of gender and ethnic stereotypes. Can we use word embeddings to understand and quantify stereotypes over time? Why of course we can, we just need text data from the past 100 years and then its straightforward to quantify biases regarding gender, ethnicity, and cultural stereotypes. In their publication Garg et al. only look into stereotypes portrayed in the US. A similar study using text data from other countries/empires, especially Britain, might uncover other latent biases. Use of Deep Learning to Examine the Association of the Built Environment With Prevalence of Neighborhood Adult Obesity. Are we shaped by our environment or do we shape it? While this paper does not look into establishing a causal link Maharana and Nsoesie show a strong correlation between features extracted from satellite image using Deep Learning and the prevalence of obesity. This is such a cool paper that basically shows that we can detect obesity from space .